A short self-guided walking holiday to enjoy hiking along the stunning coastal footpaths of the Ligurian Riviera where craggy cliffs plunge into an azure sea. You'll ramble through lush Mediterranean vineyards and olive groves whilst inland there are dense pine and chestnut forests waiting to be discovered. After checking in to your hotel base for the first two nights of the holiday, we recommend spending time exploring the first Cinque Terre village of your trip. Visible from all parts of the Cinque Terre, Monterosso's convent is worth visiting due to its wealth of historical and artistic treasures, including works by Van Dyck and Luca Cambiaso. Monterosso is also home to the only extensive sand beach in the Cinque Terre, which, unsurprisingly, proves popular with tourists and locals alike. This morning, a short train ride takes you to the start of today's walk in Riomaggiore. From here, the views of the coastline and cliffs are spectacular as you walk along the edge of the mountain chain bordering the Cinque Terre region until you reach Portovenere. Along with the Cinque Terre villages, this settlement has been granted UNESCO World Heritage status for its scenic and cultural value. For your return to Monterosso, you have the choice between taking a bus to La Spezia and then catching a train, or taking a direct ferry. You can expect today's 13 kilometre walk to take approximately six hours. Gently climbing along a narrow footpath, today's route contours through terraces and vineyards to Punta Mesco before descending to the stunningly-located village of Levanto. After spending time exploring its warren of narrow, ancient lanes and perhaps enjoying lunch in one of its cafes, your route continues along a converted railway track. Walking through tunnels and across bridges, you will soon reach the beach town of Bonassola - your base for the next two nights. You can expect today's 10 kilometre walk to take approximately four-and-a-half hours. Today's walk from Bonassola provides fantastic views over the northern Ligurian coast as you pass through the hills of the Eastern Riviera to Deiva Marina. From here, you will return to Bonassola by train. It is also possible to shorten today's route by ending in Framura. 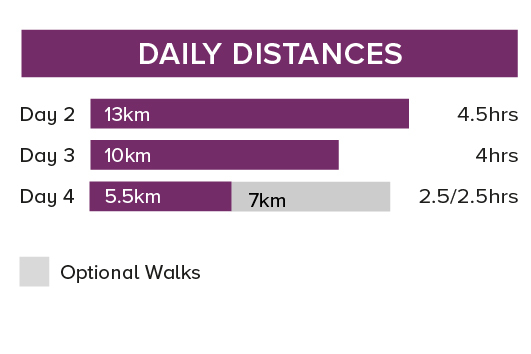 You can expect today's 11 kilometre walk to take approximately four hours, with the shorter route covering five kilometres over two-and-a-half hours. You will need one main piece of baggage and a daypack sufficiently large to take everything needed for your walking day, such as your water bottle, snacks, spare clothing and camera. Your main luggage will be transferred to your next accommodation. Please clearly mark all your belongings with your name and the name of the next accommodation and ask the accommodation owner where your bags should be left on the morning of your departure. A water bottle, sunhat and high factor sunscreen are all essential. Trekking poles are not essential but can be useful on the ascents and descents around the coast. We recommend outbound flights into either Genoa or Pisa airports which are served by both budget (including Easyjet, Ryanair) and non-budget airlines (including British Airways) from multiple airports in the UK. For this trip you can fly into and back from Genoa or Pisa airports. From Genoa airport you can take an AMT (Genoa bus company) bus to the train station. 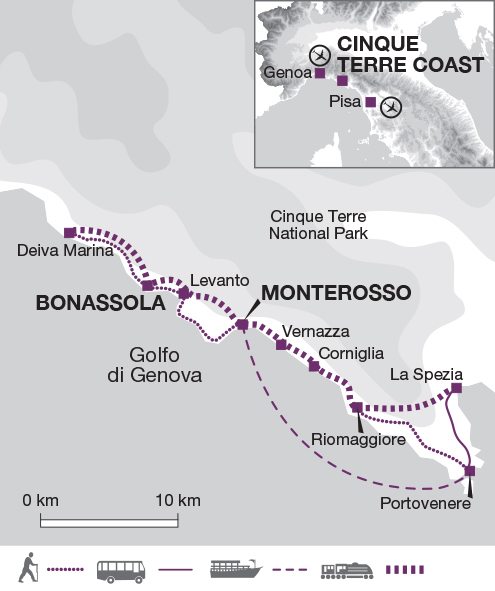 Nearly all trains from Genoa go directly to Monterosso and the the whole journey should take approximately one hour. From Pisa airport take a train to Pisa Centrale train station where you will need to change to a train to La Spezia. Change again at La Spezia to a local train that stops in Monterosso. The whole journey should take approximately two-and-a-half to three hours. On your return journey back to the airport you can reverse your journey setting out from Monterosso which is on the same rail line as Camogli. On this journey you walk 34 km over 3 days (an average of 11 km per day) with the opportunity to shorten the walks if you wish by using the local buses and trains. Your route follows well marked footpaths and mule tracks. On two days there is an ascent and descent of around 300 m whilst on the last day it is a tougher 568 m descent. Thu 28 Mar 2019 - Sat 12 Oct 2019 Your trip can depart anytime between the above dates. Contact us for triple room requests and solo traveller prices. Sun 13 Oct 2019 - Thu 31 Oct 2019 Your trip can depart anytime between the above dates. Contact us for triple room requests and solo traveller prices. Sat 28 Mar 2020 - Mon 12 Oct 2020 Your trip can depart anytime between the above dates. Contact us for triple room requests and solo traveller prices.